A while ago I heard Pete Williams at Centre for the Edge / Deloitte Digital talk about the innovation philosophy at his organisation. He said that rather than give a big chunk of money to launch one big project or idea, they give a small amount to prototype ten different small projects. Because, in general, out of ten projects; only one or two will be successful, another one or two ideas possibly OK or useful for later projects, and the rest will fail. So this approach is a simple way to not put all eggs in one basket. In another talk a couple of months back, arranged by General Assembly, I listened to an angel investor explain the investment philosophy in his industry. If angels fund ten start-ups they normally expect one or two to be successful, while the rest are anticipated to fail. So what can entrepreneurs learn from this? We are often told to find and follow our passion, and when we have found it to focus on this, whether it is photography, accounting or ice hockey. But for many entrepreneurs (and futurists), their passion is new ideas. And to focus on new ideas seems like a contradiction as we’re constantly showered by them. Some entrepreneurs therefore take a parallel entrepreneurship approach, where they work simultaneously on several ideas. The term parallel entrepreneurship is a response to the more common notion or behaviour called serial entrepreneurship, where a person starts a venture, sells it and starts another one, sells this and so on. The parallel entrepreneur, however, will start several initiatives at once. This is increasingly easier with the low cost of starting new businesses, prototyping stuff online, and testing products/services in on- or offline communities. You don’t need a fortune to start a business any longer. And soon this will be even cheaper both online and offline. Most people with common sense would say that this is stupid and that it is better to focus on one project, which you are passionate about and feel is the best and most likely to succeed. But the problem for parallel entrepreneurs is that their passions and feelings change constantly. They are passionate about many things. A mistake that I’ve made myself several times is to try to put all my passions and interests into one project, with the result that when the project failed I felt miserable, as I had personalised the project.This is easier avoided by investing emotionally in several projects. But, you might say, if you have so many projects on the go at once; will any of them ever take off and become reality? And that’s why you need more people and better structures to support you. This is a big challenge and there are obviously more for the parallel entrepreneur. Some of them are discussed by Evan Williams (Blogger, Twitter etc) and a couple of other successful entrepreneurs in a good thread on Branch. The main challenge is apparently the paradox between focus and letting go of control. It seems to be a very personal thing whether a person can / likes to work on one project or simultaneously can handle several start-ups. The key is also to pull in the right people from one’s community who are interested in investing and working in a start-up. I will experiment with the principles of parallel entrepreneurship in 2013 in order to see whether it might be something that is worth pursuing for myself. I am convinced that we need way more entrepreneurship in the future, with better systems and structures, which can hold multiple ideas, or the flow of ideas, which comes from our minds. 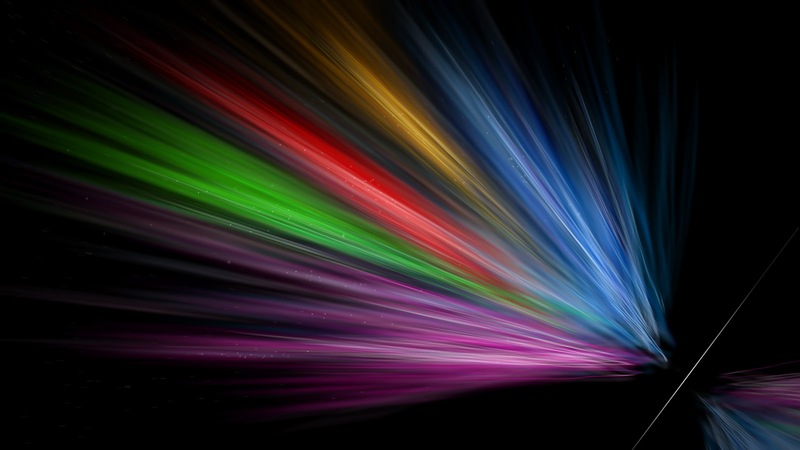 This flow of inspirational thoughts is something very valuable, which needs to be noticed, recorded and put to use, as futurist Richard Slaughter puts it. And it is key for entrepreneurial minds to create personal structures and processes to make use of all their ideas in an efficient way. I have used a four-quadrant framework, based on integral philosopher Ken Wilber, to illustrate what is needed for all ideas/projects in my case. In the upper-left quadrant are the ideas, thoughts and intuitions that pop up in my brain. These are then translated out in the external world through prototypes, products, services or “value” for others and myself. 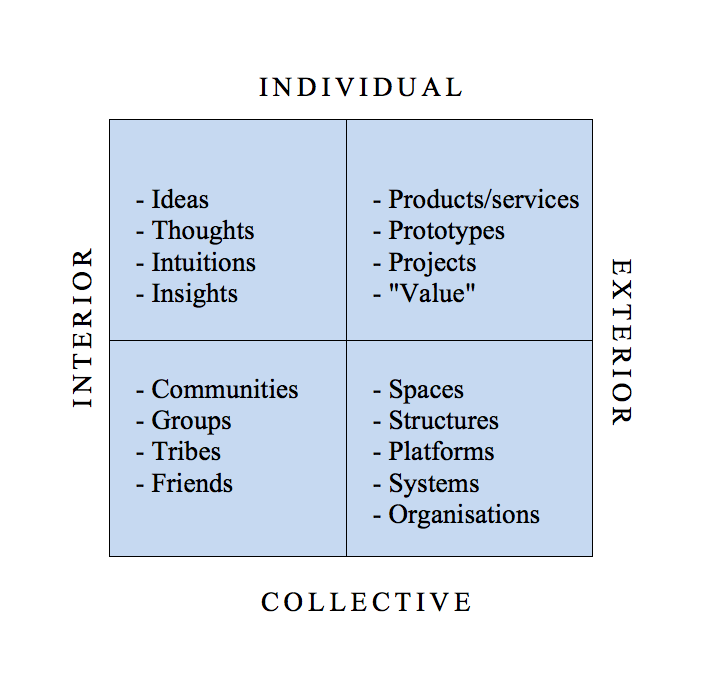 In order to do this I will need what’s in the lower quadrants; a platform or container for my ideas/projects, which can be either online or offline, populated by communities, tribes or other collectives of people. I guess the lower two quadrants are similar to what the authors of the book Power of Pull call pull platforms. For a great explanation of pull platforms check this clip with John Hagel. Each of my ideas will manifest differently externally of course – it can be a game, a text, a start-up, a film or whatever. And they will need and will attract different people. The aim here is not to make millions of dollars or change the world, but to have fun and learn while doing good and testing the financial viability of parallel entrepreneurship for me and my context. The first step, being, means exactly that. Just being and observing what goes on around me and within me. Ideas will come and I will blog them. At the same time, though, I will build some sort of prototype so that it doesn’t only stay at the idea stage. This prototype will be tested in one or a few of the communities I am part of like Hub Melbourne, The Holos Group, the Strategic Foresight community, Facebook, Twitter etc. If there is interest in these communities, the ideas will be moved on to collaborative projects and business model generation will begin. The key here is not to hang on to an idea for too long. If there is no energy from the community around you or from yourself, drop it. People might not be ready for it yet. Or you might not be ready for it. Set it aside for now. Let it fail. It might come back in another form later. I’ve reflected on possible funding models for parallel entrepreneurship for a while and will post on that subject soon. What fascinates me is that today, with borders between traditional concepts like life/work, virtual/real, corporation/not-for-profit, entrepreneur/intrapreneur, online/offline, fading away we can choose to see everyone as a potential partner and all workplaces and organisations as possible pull platforms where we can let our ideas travel. I am looking for partners and creation spaces (individuals & organisations) for most projects I work on right now. Please let me know if you like to join the craziness.